Emily Olin began her career in Russia. It was there, working at State Academy of Arts for two decades, that she taught ‘The Art of performance’, style, interpretation and art song repertoire. Many of her students went on to become winners of national and international vocal competitions. Ms. Olin published numerous articles on style and interpretation in Vocal Music. In addition as piano accompanist she toured and recorded. She holds prestigious honorary titles and awards. Coming to the United States in 1992 she continued her work as a lecturer, vocal coach, pianist and accompanist. As a visiting faculty member at Yale Opera since 1996, she has been teaching ‘Russian for Singers’ at The Yale University School of Music. She maintains a private studio in New York where she coaches professional singers and helps in the development of their vocal classical repertoire. Ms. Olin has a unique skill in preparing singers for the stage. 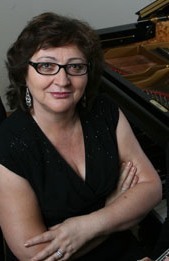 She has a thorough knowledge and expertise of the Russian repertoire. Addressing not only the diction and technique specific to singing, she works on text, musical interpretation. Many of her students, and those who have come to her for consultation, have performed worldwide in premier opera houses and festivals. In addition to teaching, Ms. Olin has continued performing, and serves on the jury of the International Doluhanova Art Song Competition “Amber Nightingale” in Russia.